In this scenario, the consultant facilitates the QCXP process for groups who desire a per participant arrangement. The client is licensed through the consultant to facilitate the QCXP process with no limit in the number of participants. The client will pay a material fee per participant. License includes class customization, train-the-trainer session, PowerPoint, facilitator’s guide, and ongoing support from consultant. Call (407) 847-8861 for a quotation. Travel expenses are not included in the price of a license if on-site train-the-trainer is requested. Be confident that your company, your customers and your staff will be part of excellent customer Xperiences with two unique Xperience Factor Certifications. Prove your awareness of how to provide great Xperiences with two unique certifications. 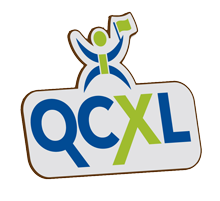 Front-Line service providers obtain the Qualified Customer Xperience Professional (QCXP) Certification through a process of classroom workshops and a demonstration of understanding. Don't be left behind in the service economy. Prepare your front-line employees and their leaders for the Xperience Economy and take the journey to Customer Xperience (CX) excellence.